First I have to say sorry for my silence on here for the last few weeks - my full time job has been utterly hectic lately and I just haven't had the energy in the evenings to get into the soaping mojo space in my head! 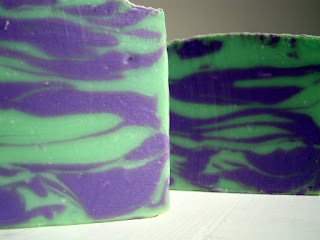 However, this Saturday was different - I felt inspired by a new fragrance I ordered recently, Lavender Lime & Vetiver. 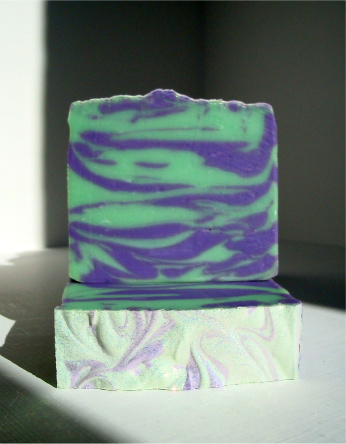 It's a really lovely fragrance and the lavender and lime are perfectly balanced against each other. I don't get a note of vetiver (the one I know from the essential oil which, I have to admit, I'm not a huge fan of) but there is a deeper musky type background to this which helps ground the lighter fragrances. It really is just a wonderful scent. 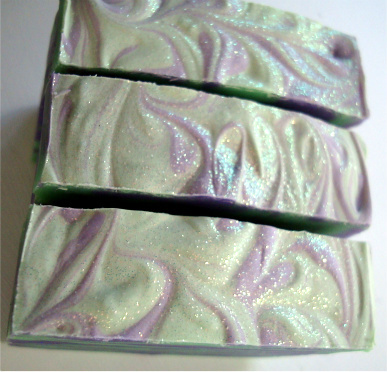 This soap has Golden Olive Oil, Cocoa Butter and Silk and is coloured with POP mica and a blend of yellow and green liquid soap colour. I dusted the top with some new glitter that just adore (the type that changes colour depending on the light - cool!). The colour is bright, the fragrance is beautiful and I just love love love this funky soap! I hope you do too! Hope you enjoy - if you're interested in buying some, this will be fully cured by 4 July. ooohhh I love the look of this one Celine, quite beautiful, that glitter is brilliant too. FAB! 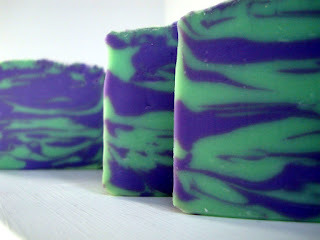 That swirl pattern is really fun. Question for you: I recently bought some nontoxic craft glitter. 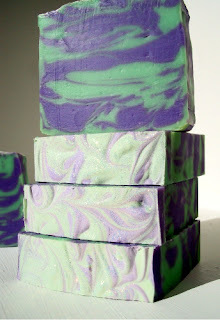 Would that be okay for soap or do you use some specifically for soap? I love how the swirl turned out. I think they kind of look like psychedelic zebra stripes. LOVE it! Oh i love that glitter. I wish I could smell it. Thanks everyone! I am totally in love with this soap and I just adore the fragrance. Sonya, I'd advise you to use cosmetic safe glitter only (that's what I use). 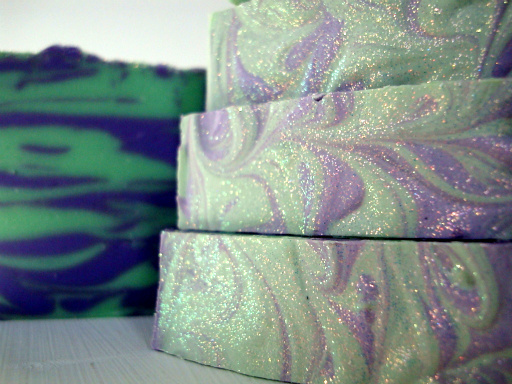 Craft glitter isn't the same thing and you need it to be skin safe. You'll find some from reputable ingredients suppliers or, if you're really stuck, you can check on ebay (just double check with the seller that's it cosmetic safe glitter). Best of luck!!! This soap is beautiful and I love the mica on top. The scent combo sounds fantastic. Your soaps are so pretty and I love the touch of mica. Your photos are excellent. What kind of camera do you use ? Thanks Formerly SS! I must list your new blog address too! Donna - I *think* it's a Samsung, it's a point and click one, a small but good digital - I'm no photographer at all! Amy - this was a fragrance oil; I've smelt Vetiver EO and it's not to my taste; I think a drop (literally) would be enough.. to me, this fragrance has a depth which is really nice (as citrus can so often fly away in CP) which holds the Lime & Lavender and grounds them but it doesn't have the notes of vetiver that I don't like (as in, it's more musky than that smokey fragrance) ... to me, it's just fresh, zingy and with a depth. I'd say one drop of Vetiver EO would be more than enough (but, as I say, I'm not a fan of it). I'm more of an FO girl myself.